Topics: Upcoming Events, The Difference, Smart Ergonomics, Versatile Integration, and Optimal Infection Control. 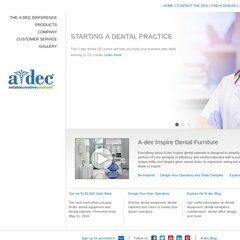 a-dec.com Dental Chairs and Dental Stools - A-dec Inc.
a-dec.com A-dec Document Library | A-dec, Inc.
351 users visit the site each day, each viewing 2.10 pages. Its 2 nameservers are ns4.worldnic.com, and ns3.worldnic.com. It is hosted by Oneneck It Services (Arizona, Gilbert,) using Microsoft-IIS/7 web server. It is written for ASP.NET language. PING www. (63.229.100.45) 56(84) bytes of data. The server is faster than 67% of measured websites, at 2657 milliseconds. Also a time of 48.5 ms, is recorded in a ping test.